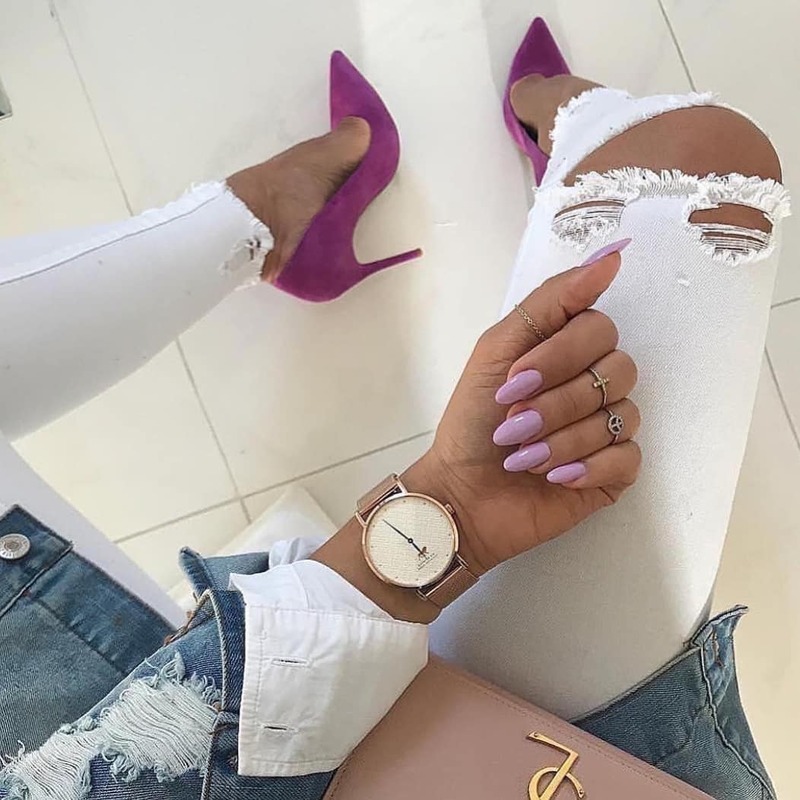 You can never go wrong with a pair of purple heeled pumps and white ripped skinny jeans. This combination will definitely make you look chic and special. Complete it with a white shirt and blue denim ripped jacket. Would you give this OOTD a try? We see a simple Summer day look for young travelers. It consists of a white shirt tucked in knee-ripped skinny jeans completed with thong sandals, oversized sunglasses, and a big tote bag. We see a beautiful white one sleeve peplum top with side flounce paired with washed blue skinny jeans and white heeled sandals. In love with the floral print clutch and oversized black sunglasses. We see a casual style double denim outfit idea for Summer weekends. It’s an oversized chambray shirt half-tucked in knee-ripped skinny jeans in dark blue color. In love with this oversized beige handbag and blush heeled sandals. 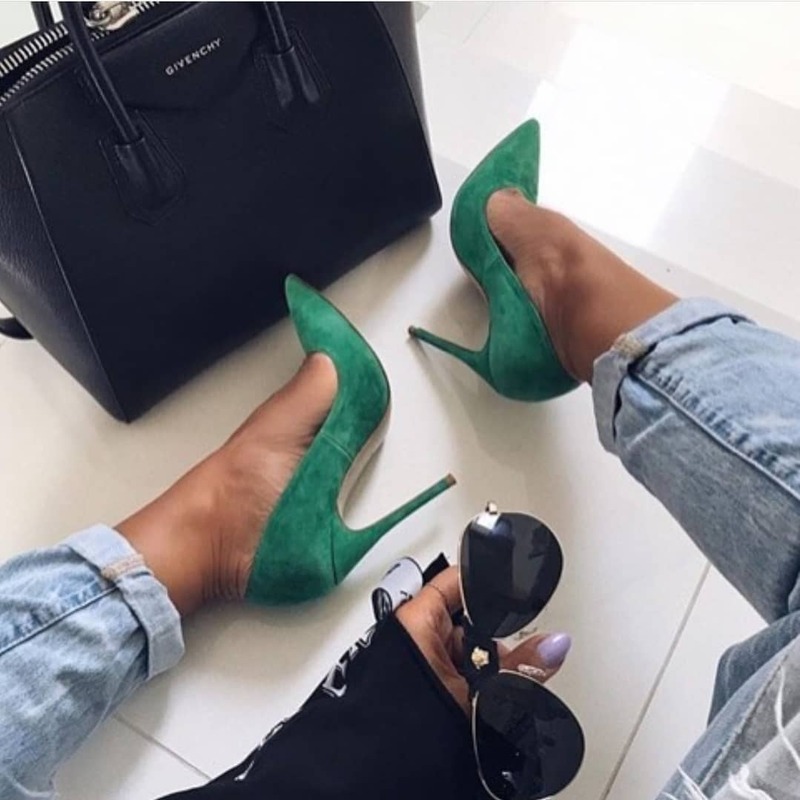 Get inspired by these beautiful green suede pumps. I am so in love with this footwear. Just pair them with your favorite cuffed boyfriend jeans, simple top, leather jacket, and aviator sunglasses. Have fun this Summer by wearing an abstract print shirt with your favorite light blue jeans. Go for heeled black leather sandals, biker style miniature clutch bag in a beige and black leather belt. I am sure you gonna love this style. A pretty basic outfit idea for young ladies who want to keep things simple and look chic. It’s a combination of a black T-shirt and knee-ripped jeans. Complete it with aviator sunglasses and black heeled sandals. Love the black round straw shoulder bag. Looking for a way to make a hot appearance on the streets? Go for a leopard print spaghetti strap top and team it with knee-ripped black skinny jeans. Complete this combo by adding black heeled sandals and a quilted black leather clutch. That’s a simple combination for young ladies. We see a white loose-fit shirt teamed with knee-ripped blue jeans and thong sandals. Love the aviator sunglasses, they make this lady look sophisticated.